Use the pit lounge as your HQ and follow the entire race as close as possible from your team! Rent your pit lounge to receive your visitors and partners, or allow riders to rest and to feed between two relays. Situated above the pits, in the 1st or 2nd floor, Le Mans trackside pit lounges offer you a direct view on the track and the pitlane. Booking form and rental conditions: contact us! The “Contestants’restaurant” will welcome you from Friday dinner to Sunday lunch and will propose you 4 themes to choose: «Tratoria », « Barbecue », « Well Being » and « Fish and Chips ». Located in the village, this local service has been set up to simplify your stay. Remember to order when you register! 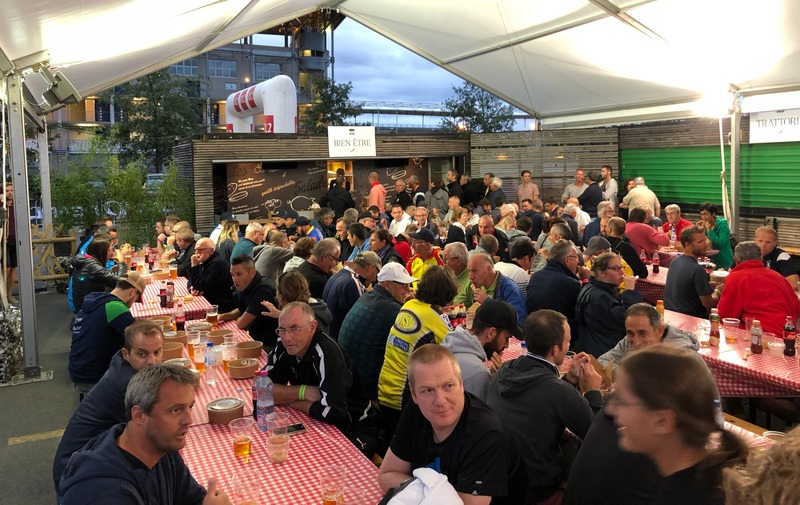 The « Houx » campsite is open for teams starting from Friday 10am. It is located about 400 meters away from the pit-stop zone. An access to the “Houx” campsite is included in the registration package. Camping spots are not reserved, participants will settle in freely as they arrive. The Ibis Styles Mulsanne Le Mans Sud Hotel*** is located a few minutes away from the circuit. It welcomes you and offers a special 24 Hours Cycling rate to participants. This new designed and original hotel is well located thanks to an immediate proximity with the mythic 24 Hour’s circuit. The Ibis Styles Mulsanne Le Mans Sud Hotel*** welcome you every day, all year long. Special rate : 80€ for the night instead of 115€ (double room with breakfast). Internet bookings will not be able to benefit from this offer. Click here to visit the website. Admission is free for visitors starting from Saturday 8:00am. 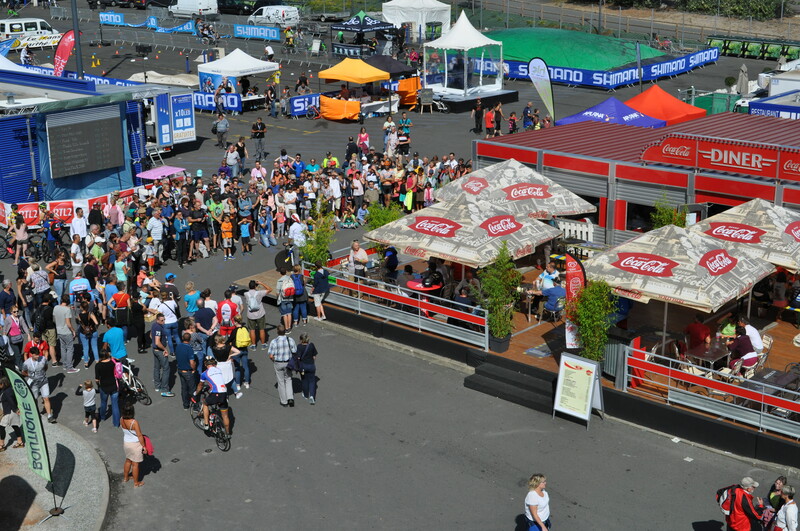 Visitors can access the track by the main entrance of the circuit. Come numerous to assist to the Le Mans Type start on Saturday 24th August at 3pm. 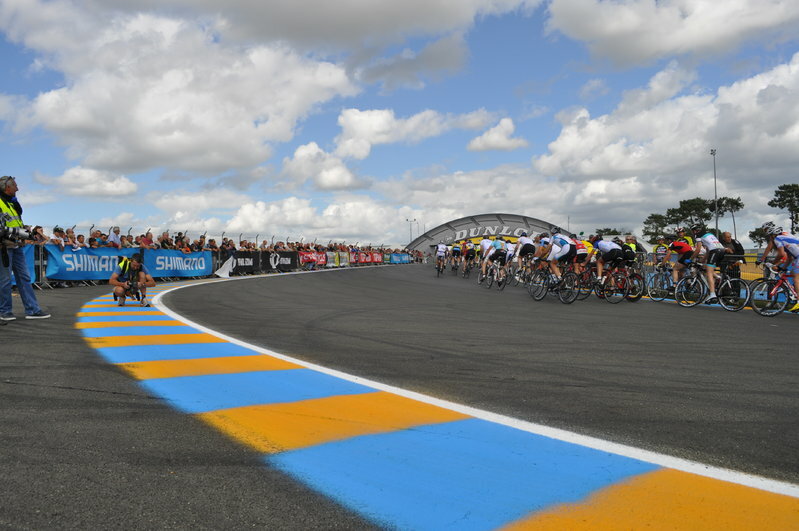 The “La Matinale Le Maine Libre ” is open to all and will precede the Shimano 24 Hours Cycling of Le Mans start. 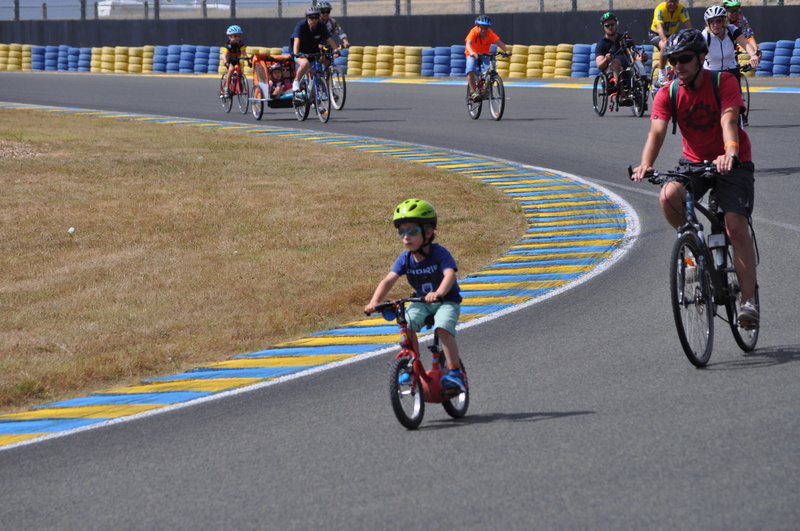 Last year, this cyclotouristic event brought together around 1500 people to experience a one hour ride on the Le Mans Circuit. Participation is free for children under 10 years old accompanied by an adult. For more information, click here. Come enjoy the village which is located right next to the pits and absolutly free. 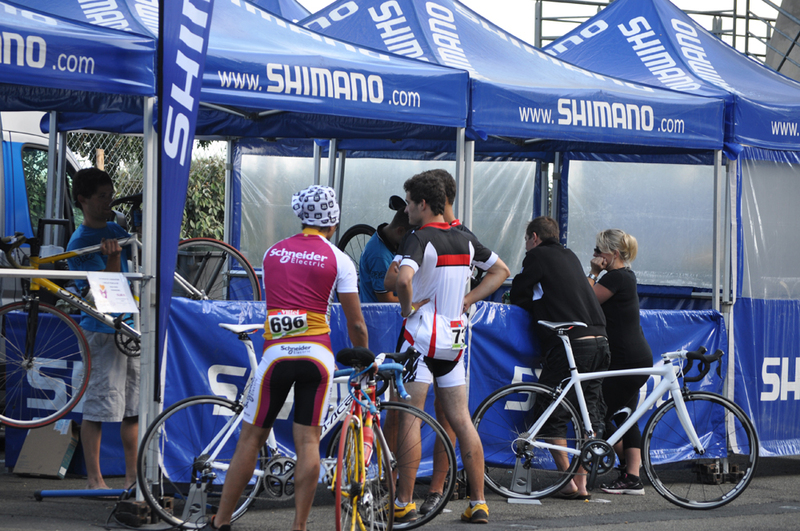 Meet with the Shimano 24 Hours Cycling partners, exhibitors and activities. You can’t miss it, it is the bungalow located directly on the entrance of the paddock! You will find here all the memories of the race which can witness your attendance at the event: cycling jerseys, shorts, t-shirts, caps, mugs, teddy bears or cycling cuffs. Come to discover our range of products with the logo of the 24 Hours Cycling. The hostesses are also at your disposal for further information. Pit accesses, campsite or restaurant options (at the “Contestant restaurant”) can be bought from them. Created in 2009, the company S1neo Cycles’s vision is to change the habits of the passionate consumer of the Bugatti Circuit with a global concept. Offer a personalized high-end bike, the choice of all the components, the service, the direct factory price and all this accompanied by a retailer in each department. Our bikes are 100% customizable and unique by our configurator (Up to 100,000 possible combinations), which is the reason for the “S1” in the name. Our commercial concept (Direct Accompanied Sales) is unique. Currently, the brand is indeed developing in France and abroad: nearly 7 countries in Europe. Also distributed throughout the world (Japan, Qatar, England, Canada, and soon China), the little French brand is in vogue. 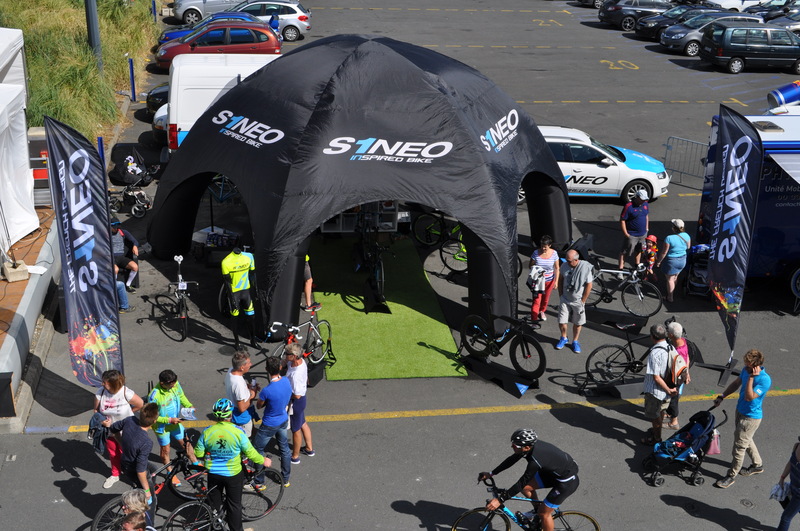 Since 2017, S1neo Cycles have an internalized production unit and manufactures two models, and soon three, “100% Français” bringing it into the very closed circle of French Manufacturers. Our recognized ambassadors (François Pervis for the track, Francis Mourey for the Cyclo-Cross or Sébastien Chavanel for the road) provide important support in the development of the products. The “Contestants Restaurant” which is located in the Village, offers this year a new principle of food service with its Food Truck system. For our ten years, we wanted to replace the Pasta Party with the “10 years of Aperitif”, followed by the Barbecue Party. We hope you will enjoy the improvements made to this local service. Our goal: to bring you more comfort and conviviality. Other spaces will allow you to refresh and eat: in the Village or even on the campsite. DJs and artists will be present all weekend to liven up the mood in the Village. Among them, Lucie Carbonne, accordionist and triple French champion of Unicycle in 2014, 2015 and 2016. Julot, winner of the Rosgocyrk prize at the International Circus Festival “Idol” in Moscow, will also be present with his acrobatic act on oscillating mast… at more than nine meters tall!!! Adult and children are welcome to enjoy the atmosphere! The Handisport 72 committee and the association “Handisport for young people” offer a presentation and tests of bicycles adapted for people with disabilities. Open to everyone, whether valid or not, come and try the experience on a sports race (slalom) in a wheelchair. The best riders will be rewarded!